Well, it was a vegan night at the Pops for Jo and I anyway – maybe some day they will have an official night. 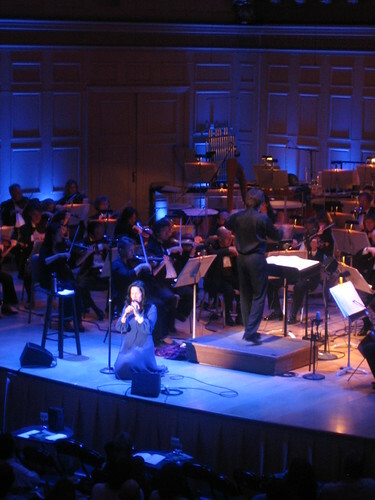 Started out with dinner at Betty’s Wok and Noodle, followed by Natalie Merchant with the Boston Pops at Symphony Hall. If you’ve never been to Betty’s it is well worth checking out – on Huntington Ave just west of Mass Ave, across from Symphony Hall (map). (This also puts them across the street from Wheeler’s Frozen Desserts, the vegan ice cream parlor at 334B Mass Ave). Their menu seems to be changing – Jo had a different menu than I did, and hers included a dish called “Va-Va-Vegan” which I don’t see on the site. Your best bet, though, is to use the “custom dish” option and create your own vegan combo. The two thai sauces (Thai-Tiki and Red Thai) contain some mysterious fish sauce, but (we were told) the others are vegan. (Again, the menu seems to be in flux – the online menu adds a “Sweet & Salty” sauce which doesn’t look vegan but wasn’t on our menu – verify with your waiter). We had the Madras Curry with Veggies and Tofu over rice and it was quite good. The Va-Va-Vegan was ok, but a bit bland for my tastes (I like spicy food). One word of caution – if you’re headed to Betty’s on a night where there is an event at Symphony Hall, make reservations and bring your “confirmation number” – with a show at 8:00, the place started to fill up right at 6:00, and by 6:30 they were turning folks away. The Boston Pops started with four movements from Holst’s The Planets (Mars, Venus, Uranus, and Jupiter), though the visuals on the screen behind them felt a bit like a 1960s elementary school film – I wasn’t a huge fan. (The Boston Herald reviewer quipped that “Venus looked like snapshots of a Play-Doh party, and Uranus must have been done on a Xerox machine”). Her performance was amazing, though at times she seemed a bit stifled by the orchestra and wanting to take control – making her classic conductor like arm movements and at one point even taking the dias from Lockhart. (See the review in the Boston Globe about Tuesday night’s performance for more on the songs and arrangements). The only real disappointment was that there was no encore – I think she was a bit under the weather, coughing between songs and thanking her daughter for the virus. It would have been a fantastic venue to hear either Jo’s favorite (“Motherland”) or mine (“Build a Levee”), or even some others from her broad back catalog. Do they not do encores at the Pops? 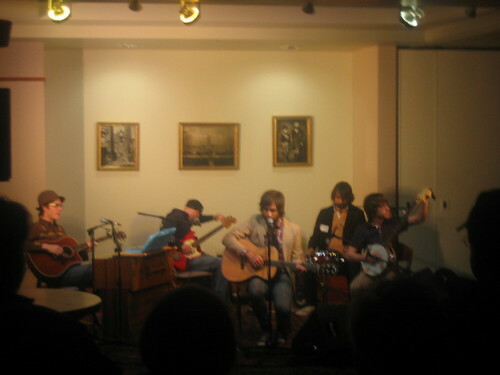 After the show, the Everyday Visuals played a mostly acoustic set over in one of the side halls – nice intimate setting for a band I’m not too familiar with but was certainly impressed by. All in all, a wonderful night of music and food in Boston.